This commercial just caught my eye and made me think about faceted search. Fallout 2 was one of the best games I’ve ever played. Post-apocalpytic, satirical, and gritty. Good times. I love how art evolves. Well sometimes I hate it, but usually it travels in interesting directions. One of my favorite new trends is art in video games, video games as art, and art in video game advertising. Andy Warhol helped bring art to pop culture and advertising. That hasn’t stopped thousands of hacks from doing a lot of crummy advertising, but every once in a while you get something amazing. The same is true for video games. After some surfing through the tubes, I came across an ad for a new razor from Norelco. At first the ad seemed innocuous and I was slightly intrigued because it looks weird and I sorta need a new razor (though I’ve been doing without for a while now). Then the flash animation changed and I was looking at the picture below. I was struck by the somewhat sexual nature of the image. It’s almost as if the robot is the object of sexual desire in this ad. If you don’t agree, substitute a naked human female in its place. I came across an interesting difference in usage between British and American versions of the word assurance. The word typically means a promise or a guarantee in American English. 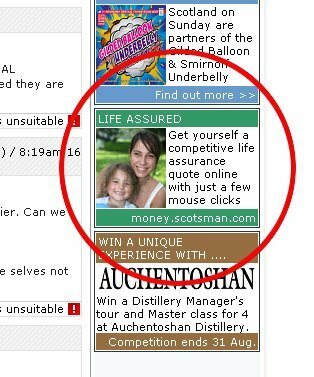 So when I came across this ad on the Scotsman it caught my eye. Hell yes I want my life assured! Turns out, to the Brits, it just means insurance. Pity.